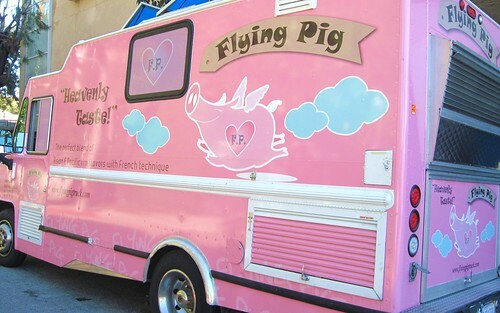 The Flying Pig Truck is the brainchild of two Le Cordon Bleu trained chefs. The food is a blend of Asian and Pacific Rim flavors with French technique. French technique!? Oh no you didn’t! The menu is focused on tacos which is different from many of the other “gourmet” food trucks that offer the taco more or less as an homage to LA’s most common street food . But with The Flying Pig Truck it’s about the tacos (they also have sliders and pork buns) . I ordered three tacos - grilled beef short rib with mushroom and oyster death sauce (still alive! death sauce smeath sauce), tamarind duck with toasted almond and pickled beet salad, and smoked chicken with green curry and napa slaw. Oh that french technique. The first to meet my belly was the tamarind duck taco. The first bite was awkward with an uneven duck/beet/almond ratio and with a mandarin orange slice bouncing off my lip and landing somewhere on Sawtelle Blvd. But as my palette started to adjust and as I got deeper into the taco all the flavors came together and it was nothing short of fantastic. The duck was fresh and full of flavor and the almond and beet were very complementing with the other mandarin orange providing a refreshing finish. Next up was the grilled beef short rib with oyster death sauce. I prepared myself for the worst case scenario and I texted a friend of mine. And it was. When I read oyster death sauce I expected to feel some hum on my lips or at least having to reach for the closest cold beverage. But….nothing, not a single bead of sweat rolled down my forehead. Don’t get me wrong, the taco was good, the beef was spot on but the oyster death sauce didn’t live up to it’s name. Last but not least was the smoked chicken with green curry and napa slaw. The texture and flavor reminded me of Larb (a thai chicken dish) but it had an extra little twist of curry flavor to it. The slaw gave the taco a nice crunch and the chicken had that wonderful larby flavor. Tacos are $2.50 each which by street taco standards is a lot but the quality of ingredients and the unique flavors makes it well worth it. I like that Flying Pig is all about the tacos and truly lives up to the gourmet taco label. Hey Bandini, that duck taco sounds great, very interesting concept, To bad we have so many regulations on mobile trucks in San Diego. 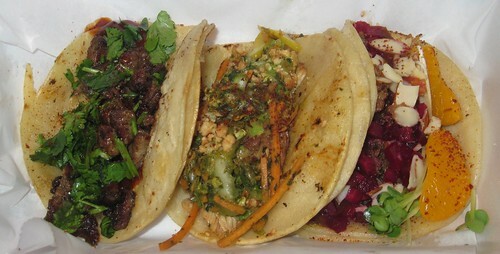 i think the menu is focused on tacos which is different from many of the other gourmet food trucksan dvery tasty. Hmmmmmm...gotta keep my eyes open for the Flying Pig Truck. I would love to try that duck taco for myself.